I confess. I have something to love about winter. No it’s not the cold, blowing wind. Or the icy fingers and bottoms when we get into the car. It’s AMBROSIA APPLES! Have you ever had one of these delicious treats? 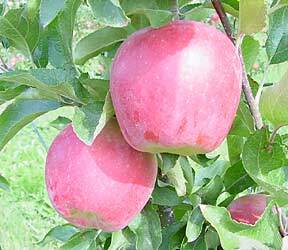 They are my absolute favorite apple and they’re only available in our grocery stores around this time of year. Ambrosia means “fruit of the gods” and I would have to agree. Apparently they come from British Columbia and were just developed in the ’90s. They are sweet and crunchy, and it’s like having a wonderful dessert (except without the mess of making it). So winter, thank you for giving me Ambrosia apples. As for the rest of you, I’m done and ready for your cousin spring.